Publisher: Self-Realization Fellowship, Los Angeles, California, U.S.A. In this unprecedented masterwork of inspiration, Paramahansa Yogananda takes the reader on a profoundly enriching journey through the four Gospels. Verse by verse, he illumines the universal path to oneness with God taught by Jesus to his immediate disciples but obscured through centuries of misinterpretation: "how to become like Christ, how to resurrect the Eternal Christ within one's self." 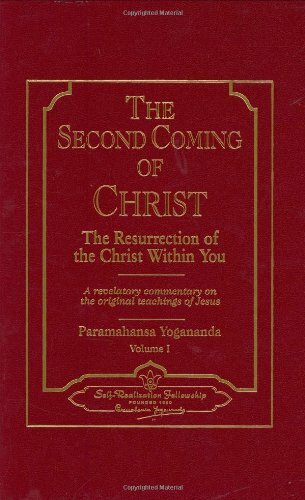 Yogananda said, "In titling this work The Second Coming of Christ, I am not referring to a literal return of Jesus to earth. He came two thousand years ago and, after imparting a universal path to God's kingdom, was crucified and resurrected; his reappearance to the masses now is not necessary for the fulfillment of his teachings. What is necessary is for the cosmic wisdom and divine perception of Jesus to speak again through each one's own experience and understanding of the infinite Christ Consciousness that was incarnate in Jesus. That will be his true Second Coming." Born in India on January 5, 1893, Paramahansa Yogananda devoted his life to helping people of all races and creeds to realize and express more fully in their lives the true beauty, nobility, and divinity of the human spirit. After graduating from Calcutta University in 1915, Yogananda took formal vows as a monk of India's venerable monastic Swami Order. Two years later, he began his life's work with the founding of a how-to-live school since grown to twenty-one educational institutions throughout India where traditional academic subjects were offered together with yoga training and instruction in spiritual ideals. In 1920, he was invited to serve as India's delegate to an International Congress of Religious Liberals in Boston. His address to the Congress and subsequent lectures on the East Coast were enthusiastically received, and in 1924 he embarked on a cross-continental speaking tour. Over the next three decades, Paramahansa Yogananda contributed in far-reaching ways to a greater awareness and appreciation in the West of the spiritual wisdom of the East. In Los Angeles, he established an international headquarters for Self-Realization Fellowship, the nonsectarian religious society he had founded in 1920. Through his writings, extensive lecture tours, and the creation of Self-Realization Fellowship temples and meditation centers, he introduced hundreds of thousands of truth-seekers to the ancient science and philosophy of Yoga and its universally applicable methods of meditation. Today, the spiritual and humanitarian work begun by Paramahansa Yogananda continues under the direction of Sri Daya Mata, one of his earliest and closest disciples and president of Self-Realization Fellowship/Yogoda Satsanga Society of India since 1955. In addition to publishing his writings, lectures and informal talks (including a comprehensive series of Self-Realization Fellowship Lessons for home study), the society also oversees temples, retreats, and centers around the world.